NEW YORK – Shmaltz Brewing Company, ringleaders of the sideshow-inspired Coney Island Craft Lagers, is excited to announce the release of Coney Island Barrel-Aged Human Blockhead. Weighing in at 10% ABV, this burly Imperial American Bock has aged over five months in first-use Buffalo Trace Kentucky Straight Bourbon Barrels. While Human Blockhead originally was conceived as a Tough-as-Nails strong lager, Barrel-Aged Human Blockhead is the evolution of a true professional, bearing the signature richness of Munich and Vienna malt but emerging from the barrel softened and silky, with hints of maple, caramel, and vanilla. With approximately 500 cases produced, Barrel-Aged Human Blockhead is as rare and special as it is highly coveted. Coney Island Barrel-Aged Human Blockhead joins the Shmaltz line-up as the third member in the Limited Engagement Barrel-Aged series, which also includes 2010 Great American Beer Festival Silver Medalist HE’BREW R.I.P.A. on Rye; 2011 World Beer Championships Gold Medalist HE’BREW Vertical Jewbelation; and HE’BREW Genesis 15:15, a 15% ABV barleywine brewed with grapes, figs, dates, and pomegranates, which will be released Fall 2011. The Limited Engagement Barrel-Aged series not only represents some of Shmaltz’s most decorated beers, but also boasts the highest consumer ratings from BeerAdvocate.com and RateBeer.com. The latter recently ranked Shmaltz Brewing as one of the “Top 100 Brewers in the World” for 2011. With the release of Barrel-Aged Human Blockhead, Shmaltz Brewing continues to design unique and sophisticated beers that can stand with the world’s best specialty beverages. In a fusion of Old World brewing tradition with bold, flavor-driven American ingenuity, Coney Island Human Blockhead and Barrel-Aged Human Blockhead are examples of how Shmaltz has elevated lagers to the creative peaks ales have enjoyed in the American craft beer movement. Not surprisingly, Coney Island Human Blockhead has garnered top awards across the country since its debut in March 2009. In its first bout against other strong lagers at the 2009 United States Beer Tasting Championships, Human Blockhead took home the Gold Medal and then was designated the Bock/Doppelbock Grand Champion the following year at the World Beer Championships. Like the other beers from Coney Island Craft Lagers, Human Blockhead pays tribute to the eclectic performance culture of Coney Island, New York. The Human Blockhead stunt, developed by renowned musician and sideshow entertainer Melvin Burkhardt, is kept alive today by Donny Vomit, whose persona is captured on the Human Blockhead bottle label. Known for spellbinding stage antics with his trusty hammer, sixty-penny nail, and occasionally a power drill, Donny is thrilled to be featured in the Coney Island Craft Lagers line. “As a kid, I always thought it would be cool to have an action figure made after me, but having a kickass beer is a whole lot better,” says the man behind the mustache. 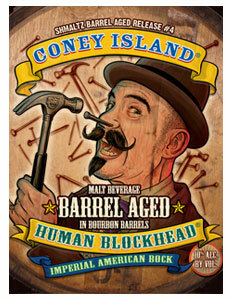 Coney Island Barrel-Aged Human Blockhead is nationally available in 22 oz. bottles and limited draft at specialty shops and select bars from August – October 2011. A portion of the proceeds of Coney Island Craft Lagers help Coney Island USA, a 501(c)(3) Arts Non-Profit, fulfill its mission to defend the honor of lost forms of American popular culture in Brooklyn’s historic Coney Island neighborhood.